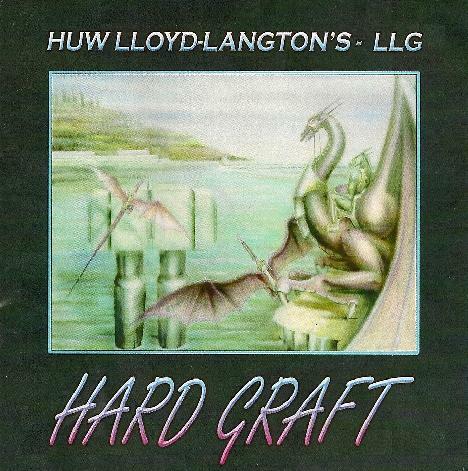 Huw Lloyd-Langton's LLG - "Hard Graft"
The first decade of the new millennium has been a challenge for Huw Lloyd-Langton. Huw contracted Legionnaires Disease in 2001 and didn't regain full health until 2007. Recording was completed on Hard Graft in 2008, and then two weeks later keyboardist Tim Rice Williams died of cancer. The album sat for a while but when Huw picked it up again problems with transference between different studios resulted in lost guitars and vocals and Huw had his hands full with re-recording. And then in September 2009 Huw came down with food poisoning, causing septacaemia and renal failure. And so… the August 2010 release of Huw's first new album since 1999's Chain Reaction must come to him with a great deal of relief and satisfaction. And what an achievement it is. Hard Graft features 9 songs plus 3 bonus Blues tracks. All the music was composed by Huw, with lyrics on several tracks by his wife Marion. Accompanying Huw on the album is Richard Gillespie on bass, Volker Von Hoff on drums (Rog Mogale drums on Hey Mama), and the late Tim Rice Williams on keyboards. There have been more Hawkwind members over the years than most normal people can count, but in terms of accomplished musicianship, Huw is among the best that band have ever had. Certainly the best guitarist that has ever served aboard the Hawkwind mothership. And the music on Hard Graft is a delightful combination of well crafted songs and stunning guitar work. Among the highlights are the two part title track. Hard Graft (Part 1) opens the album. The songs rocks, but Huw's guitar packs an emotional punch with his gorgeously tasteful leads which are melodic, yet mind-bendingly spaced out. Hard Graft (Part 2) closes the main set of songs, and once again Huw's guitar takes off into the cosmos… rocking, jamming and tripping away. Beautiful. Sandwiched between the title tracks are an outstanding set of songs. A Dream is a highlight, being an almost symphonic slab of space-prog, and includes some truly ripping guitar work. So Long has a jazz-fusion feel and an interesting rapping bit at the end. Strange Flower has a metallic edge. And PDT - Photo Dynamic Therapy, written for the Killing Cancer charity, may well be the most personal track for Huw on the album. Again we're treated to amazing guitar work. Huw's spaced out, screaming Bluesy leads are almost like a purge of sorts. The set is rounded out by three short solo Blues guitar tracks that showcase another side of Huw's considerable talents. Overall, a fantastic album that's high on my list of favorites for 2010.